Necklace in shades of yellows, oranges and lilacs. We LOVE this necklace! It arrived amazingly fast. The colors are vibrant and the craftsmanship is excellent! From painter to jewelry designer: it's all seen and made through the artist's eye! I have been a painter all my life since I graduated in painting from the Accademia di Belle Arti in Rome (Italy). I have lived in Italy and several other countries as I was growing up, through my adolescent years. This is when my interests and tastes started taking shape: my love for color, art in its many forms, fashion, all things beautiful. It is later in life that I felt the need to apply my sense of beauty to a different form of art: jewelry. I feel that I treat the making of a necklace the same way I do a painting. It is a process of transferring ideas onto a surface, playing with forms, combining colors that move me and producing an object that really pleases me. I work with simple materials: beads of all kinds, metal wire and thread. 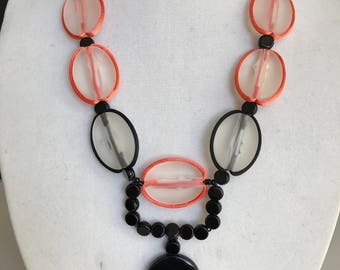 It takes me a long time to make a necklace: I often start the same piece several times, changing colors, substituting beads and finish it only when I am totally pleased with it! Each necklace I make is one-of-a-kind because only this way do I feel total satisfaction when the work is complete!